The concern for Chinese workers comes despite Trump's slogan to "Make America Great Again" and his repeated vows to bring back US jobs, which he complains have been lost to other countries, particularly China. ZTE, which employs 80,000 people, said last week that its major operations had "ceased" after being banned for seven years from buying critical American technology, raising the possibility of its collapse. Its fiber-optic networks depend on US components and its cheap smartphones sold en masse abroad are powered by US chips and the Android operating system. US officials imposed the ban because of what they said were false statements by the firm over action it claimed to have taken regarding the illegal sale of goods to Iran and North Korea. ZTE pleaded guilty to the charges in March last year and was hit with $1.2 billion in fines. At the same time, threats of mutual tariffs have sparked fears of a trade war, after Trump accused China of unfair practises that have cost American jobs. The Washington Post reported late Sunday that the White House and senior Chinese officials are discussing a deal that would relax the severe penalties on ZTE, in exchange for unspecified demands from Trump. 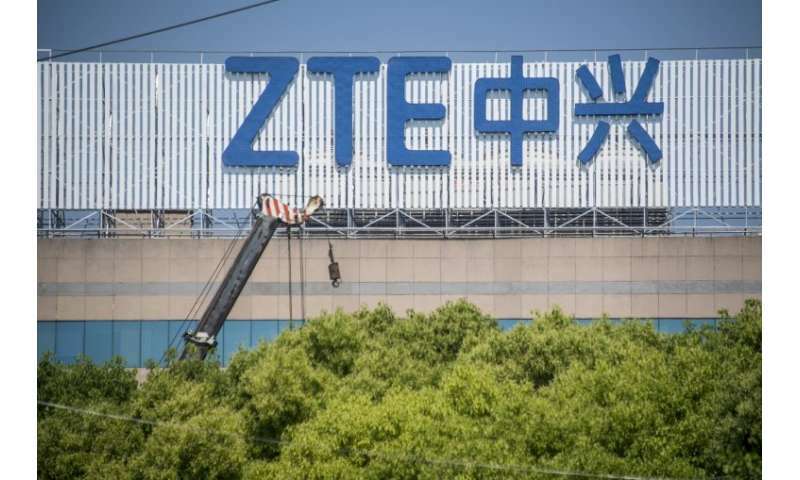 Citing people briefed on the discussions, the Post said ZTE has become a bargaining chip as Washington seeks trade-related concessions while pushing for cooperation on sanctions against North Korea and Iran. Beijing's top economic official, Vice Premier Liu He, is due in Washington this week for trade talks. But the Post reported that a high-level Chinese delegation was in Washington on Friday and raised the issue of whether Washington could relax its stance on ZTE. Cheng Xiaohe, an international relations professor at China's Renmin University, said last week that Washington had sent Beijing a clear signal "through its attack on ZTE: compromise, make compromises" on trade. There has been an intense rivalry for supremacy in emerging technology fields such as artificial intelligence and 5G, the next-generation superfast wireless systems. Against that background, the Pentagon cited security risks in banning personnel on US military bases from buying equipment from ZTE and fellow Chinese maker Huawei. "Our intelligence agencies have warned that ZTE technology and phones pose a major cyber security threat," said Adam Schiff, who is the senior Democratic Congressman on the House Intelligence Committee.